Wegmans Food Markets, Inc. a regional supermarket chain with headquarter in Gates, New York, was started by John and Walter Wegman in 1916 as the Rochester Fruit and Vegetable Company. In 1921, Walter and John Wegman purchased the Seel Grocery Co and expanded operations to include general groceries and bakery operations and within 9 years, Wegmans started a 20,000 square-foot Clinton Avenue store with cafeteria seating for 300. They featured meats, baked goods, groceries, dairy and other household products. In 1968, they went outside the Rochester area for the first time with their new store in Syracuse. In 1977, they again expanded by opening their first Buffalo store. In 1993, their expansion continued in Erie, Pennsylvania; New Jersey in 1999; Virginia in 2004 and Maryland in 2005 with some future plans for Northborough in 2011 and another in 2013 in Burlington. In January 2007, Wegmans announced two new business ventures: The first is to start a 19,000 sq ft liquor store in Pittsford and the second is to start a US$28 million “Culinary Innovation Center”, a corporate research and development facility that will house a new central kitchen. In 2008, the liquor store opened with the name of Century Pittsford Wines. Wegmans has received various prestigious awards. In 2005, Wegmans became 54th largest privately held company. Wegmans has been repeatedly featured on FORTUNE magazine’s “100 Best Companies to Work For,” and given the ranking #2. 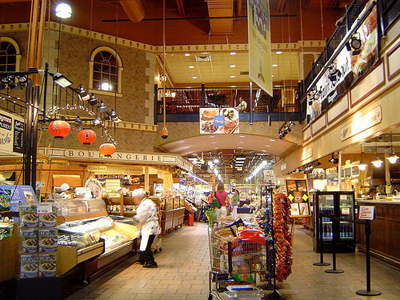 In 2007, Wegmans ranked 32 on the 2007Supermarket News list. In 2009, Wegmans ranked 29 on the Supermarket News list of the Top 75 North American Food Retailers based on sales volume.